On Labor Day Monday 2014, Pam, Jamie and I walked out to Tennessee Pass after starting two days earlier in Copper Mountain. We had completed segment 8 of the Colorado Trail. Jamie and I had walked 142.6 miles on the Colorado Trail that summer. 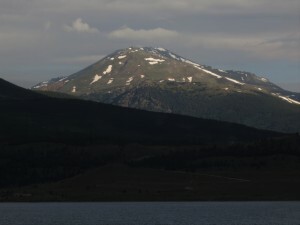 Pam had hopped in on the action beginning at Kenosha Pass and had thus completed an impressive 71 miles that same summer. We had become an efficient little three person backpacking ensemble. Pam usually set the pace and could move along all day long, consistently guiding us to 20 mile days. On longer mountain ascents she and Jamie would walk in time singing “just put one foot in front of the other” until they would crest a pass or saddle. I, on the other hand, would be like a Labrador Retriever, often falling behind looking for wildlife, taking photos or generally lounging about. I’d then catch back up once they stopped to rest somewhere. The plan for 2015 was for the three of us to do a ten day journey on the CT, taking the Collegiate West route in celebration of my 50th birthday. But, alas, the best laid plans of mice and men often go awry. In May of 2015 Jamie broke his kneecap and was out for the backpacking season. Pam and I took advantage of his down time doing a five day trip through the first five segments of the trail that she had missed the year before. Then her knee began to give her problems, so I did a solo 10 day trek last year covering the eastern collegiate peak section of the trail. This year, Jamie has healed and is back on trail. However, Pam found out last week that her nagging knee issue is in fact a fraying bone, while still having good cartilage in her knee. She will be a candidate for a total knee replacement but has some decisions to make about when to make that choice. With all the changes, Jamie and I have planned on doing some of the trail this year together again. We’ll go back with Pam somewhere down the road and catch her back up; we all have the rest of our lives to do this, so we exercise patience. Friday morning, July 1st, Jamie and I drove to Tennessee Pass to pick up where we left off almost two years ago. We would walk 48 miles from Tennessee Pass to Clear Creek Trailhead covering segments 9, 10 and 11. I had walked 10 and 11 last year so some of this would be a repeat for me. Jamie looked at me quizzically like he often does and said, “What…what…what?” I had done what all folks fear in their life. The thing that hangs in the back of their head every time they zip a sweater, jacket or piece of attire up to their neck. I had snagged the skin of my adams apple in the zipper; but like good. Like I had to unzip out of my adams apple much like you do with a sleeping bag or tent zipper when it gets caught on fabric. It was a less than glamorous beginning to our three day excursion. By lunch time Friday we had made good time and passed a few camps where people were either still sleeping or getting a somewhat late start packing up after being in the rain all night. We met a group of southbound CT thru hikers in their 20’s. They had started from Denver on June 20th and were part of some of the first groups hiking through for the summer. One of them caught us on an uphill section in the Holy Cross Wilderness. His hair was matted down from the rain and he shared that he was frustrated with his tent, as it had been quite wet on the inside from the previous night. He had the same tent that I recently purchased, so this did not make me feel particularly well. We chatted as we walked together and regrouped after separating on the uphill. This matted man had a pack cover as most folks did on this wet day. However, his was bright lime green and made it look like he was hauling a piano on his back. I did not get his trail name but dubbed him “Piano Man” for easy reference between myself and Jamie. 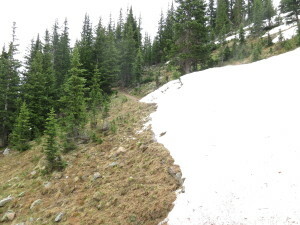 Snowpack still covers parts of trail on July 1st, but only barely. While we stopped for lunch, Piano Man, Dirt and Sparky passed us. A bit later we caught up to Piano Man as he was fishing and had caught a brook trout and wanted me to take his picture with it. He was happy to find good fishing and it would be the last we would see of him during our three days. 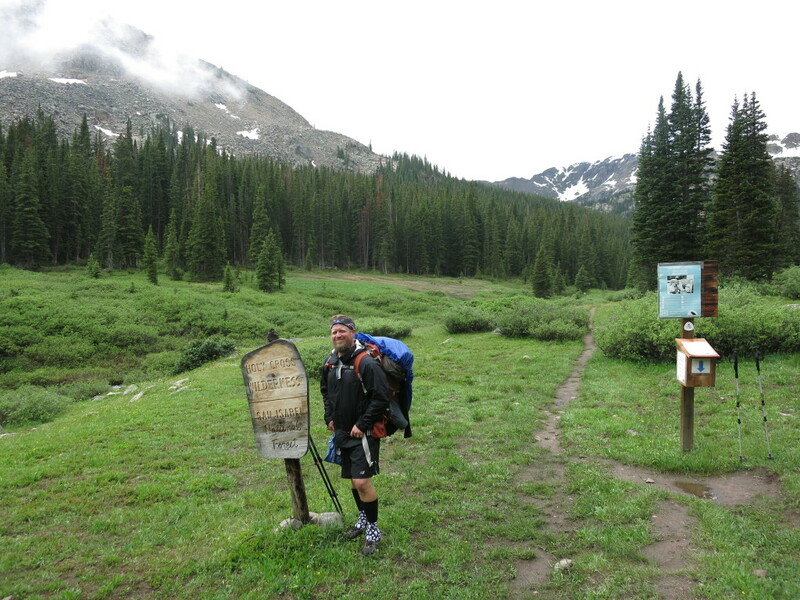 We encountered a slew of northbound Continental Divide Trail thru hikers. We spoke to one who had begun from the border of Mexico in late April. “You’re looking good”, I told him. He replied thank you but noted that he was not even half way yet in his endeavor to get to the Canadian border on the long trail of the CDT. We must have seen fifteen or so of these hikers and they all looked the same; tan, lean, lithe and with big bushy beards. Most of them carried packs a fraction the size of mine yet they were walking sixty times the distance over a span of months, not three days. Granted they resupply every five or six days, but even so it is easy to see how their bodies have adapted to trail life. While we spent a lot of time taking off and putting on our rain jackets, they just trudged on in light shirts and shorts, oblivious to a light drizzle. I commented to one CDTer that they all look the same; basically like homeless people in the wilderness. He laughed out loud and told me about a guy that was attempting to hitch a ride into town one day for a resupply. A woman stopped and offered him a ride also attempting to stuff a dollar bill into his shirt pocket. “No, m’am, really, all I want is a ride into town” he protested as she felt the need to help the “poor guy” out. I continue to be impressed by this lot of people that have the drive and determination to walk 3,100 miles from Mexico to Canada. It’s impressive how they deal with the challenge of a long trail. Come Friday evening, Jamie and I stopped to filter water about a half mile from where we planned to camp. Of course, it rained steadily as we made our way to a saddle at 11,000’ and pitched our tents in the rain. Gratefully, we found a nice dry spot under an evergreen to have our dinner of chicken, rice and cheese burritos. After over 18 miles my appetite was ravenous. We hit the sack and my tent did a great job of keeping me dry through the night’s drizzle. Saturday we leap frogged with Dirt and Sparky most of the day. 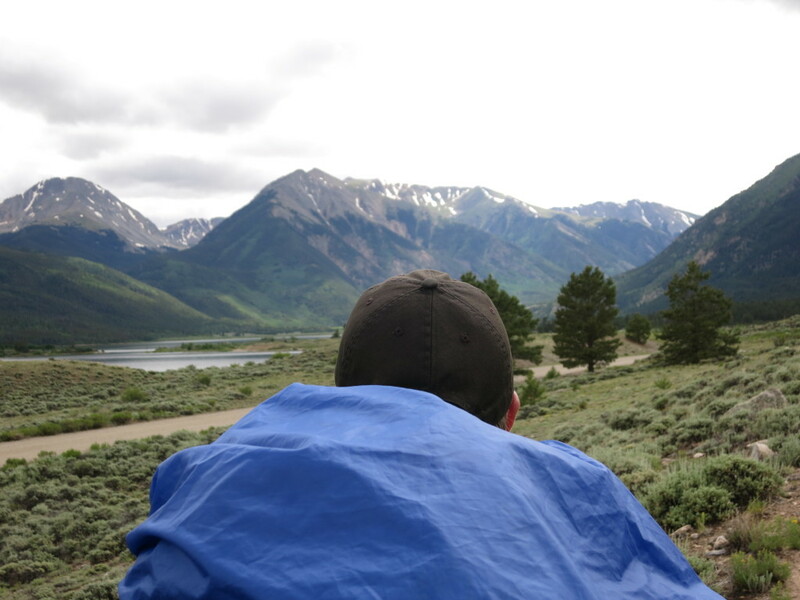 We didn’t see a lot of backpackers but mostly day hikers looking to bag Mount Massive and Mount Elbert, the two tallest peaks in Colorado. 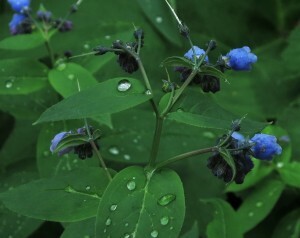 It was a rainy day again and at times rained harder than the previous day. Dirt and Sparky were obviously in a good grove and had their “trail legs”, moving quite a bit faster than us. Even with sizeable packs (again, they looked huge because of the pack covers) they made quick steps on the trail. Both Friday and Saturday they had their wet tents in balled up garbage bags as they made their way with trail-provided natural walking sticks. Dirt had handkerchiefs tied to his walking sticks and I told him it seemed like he should just tie the bag fast to the stick and move along “hobo style”. Jamie and I decided to go long today thereby having only a short day to complete on Sunday when Pam was picking us up. We ended up camping along the south side of Twin Lakes, past Twin Lakes village and put another 20 miles under our feet that day. We were weary by day’s end and I slept better than I had in a long time in my again dry tent (so grateful for no condensation) even though I somehow aggravated by pack and noticed this halfway through the night. Sunday morning graced us with an actual sunrise! I had my coffee and declared to Jamie that I would no longer be carrying oatmeal on the trail to eat for breakfast. I didn’t care much for the stuff anyway, and no matter how I doctored it with peanut butter, dried fruit and nuts, it still was not all that appealing to me. I enjoyed the last tortilla with a some cheese inside and sipped my luxurious cup of joe. It feels good at times to make such big “trail decisions” which will impact how I live life on the trail in the future. Mount Massive on Sunday morning. The evening before as I was journaling I mentioned to Jamie that since we had a short day on Sunday I intentionally wanted to relax and reflect on our last day to meet Pam. We stopped for trailside coffee after four miles and chatted about some deeper aspects of our lives that have transpired over the last year. Hikers and mountain bikers passed us on the singletrack below while more mountain bikers and some ATV’ers passed us on the forest road above. Coloradoans were enjoying the long holiday weekend and it was nice to wave at folks as they passed by. As much as I was into setting a good tempo the previous two days I now stopped often snapping photos since the sun was out and taking in the copious amounts of wildflowers that graced the trail. It was a good three days on trail but a slight shock to the system being at or above 10,000 feet for much of it. At the end of the month Jamie and I plan to do a six day trek of the Collegiate West section of the Colorado Trail. It will be no joke as there is a lot of high mountain passes to climb which will expose us to extreme weather and high elevations. 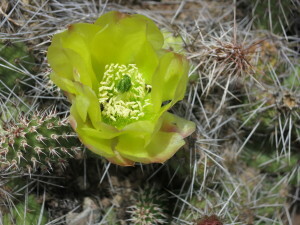 However, all who have done this route sing high praises of the beauty that it has to offer. We are a little nervous with a healthy respect that the being in the wilderness entails. Kinnikinnick shows off green and red. 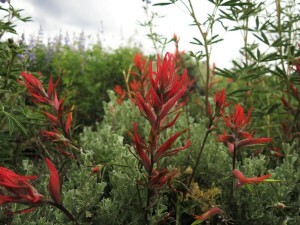 Indian Paintbrush stands at attention in front of pale green sage while a supporting cast of wildflowers stand in the shadows. 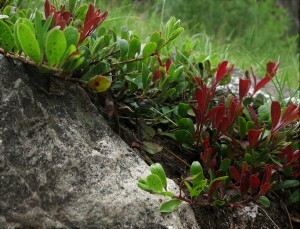 It’s nice to reach down and pinch off some sage in areas such as these. To date if my calculations are correct I’ve covered the first 14 ½ segments of the Colorado Trail from Denver to south of Monarch Pass on Highway 50 west of Pagosa Springs. I’ve also done the majority of the Collegiate West segment 5 heading northbound. Including segments I’ve repeated with Jamie and Pam, I’ve hiked roughly 380 miles on the Colorado Trail in the last three years on trips from two to ten days. I’ll be adding to that total at the end of the month and it will take another year or more likely two to finish the whole thing. I love the social aspect of the trail, encountering other like minded people on miles of single track trail. 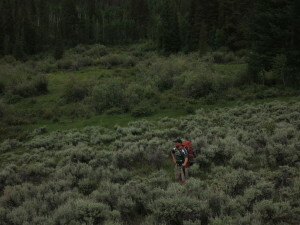 However, I also gain much from solo experiences in backcountry areas exploring where there is no trail and no people. I like to mix it up and have no hurried agenda to complete the CT. Someday I would like to hike the complete trail from south to north in one shot making a thru hike of it. It’s good to have goals, it’s good to complete them, and it is also good to not always complete them. Ultimately, my true goal is to avoid complacency and associated boredom that can often come with it. This entry was posted in Enrich, Solace, Trail Time by Matthew. Bookmark the permalink.